In the years before my mom died, she was a passionate member of Breast Cancer Action’s Board of Directors. In BCAction, she found a community and a cause that was deeply important to her. 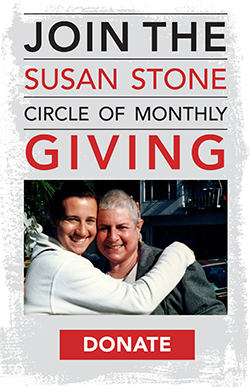 To honor my mom’s leadership and activism, after she died, BCAction established a monthly giving circle in her honor: the Susan Stone Circle. My mom knew how important it was for BCAction to have sustainable, ongoing financial support and she wanted to have an impact even after she died. Besides me (her only child), I think this giving circle is the legacy she would be most proud of. Become a member of the Susan Stone Circle today. Join me in making a monthly gift to BCAction in honor or memory of your loved one. During my own diagnosis, I understood on a deeper level why BCAction was so important to my mom. I am so grateful to this organization for providing patient-centered, unbiased information–free of Big Pharma influence. And I love that BCAction is a place for people to be advocates to make change, and that they focus on breast cancer as a social justice issue requiring systemic solutions. Join me in making sure BCAction has the ongoing support they need to organize and take action for women’s health. Make a donation and become a Susan Stone Circle member today. My mom was an amazing role model for me as a woman and a feminist: she was opinionated and fierce, loved to laugh, and she taught me that it was important to stand up for the things we believe in. Stand up with me today to provide BCAction with crucial ongoing support. For me, for my mother, for all of us who have had breast cancer – thank you. P.S. If you prefer to make a one-time donation in honor of your loved one, click here. Over 75% of BCAction’s funding comes from individuals like us, so every dollar makes a difference.